well, walk-runs. we (DH and i) have agreed that we will run every other day. we have a nice loop that is mostly downhill, or at least so it seems - we park the car halfway up a hill, i walk to the top with claire as my warm up, and then start the run-walk (30 second intervals) and it is flat or downhill for the next 2 miles or so. one more hill, then instead of going back to the car (uphill), we turn down toward the sea, and end up at 3 miles. then we walk back to the car (uphill) so we get a total of 4 miles. and we stretch. i haven't quite gotten to the woohoo endorphin stage, but i can feel improvement with each run. and i try not to think about other years, when i have been able to run the entire way, or even do two laps around the loop without the extra downhill toward the sea. it feels like progress, and that is good. sometimes we are rewarded with whale sightings; sometimes deer. we try to go early, before the heat comes up. rounded off the day with a walk break from work, and some zen weed pulling in the garden. more than hit the step goal yesterday, and weight is bottoming out at the low end, almost scream weight. but no problem there - we were invited to dinner, marvelous hostess, ate probably a bit too much, but the lovely hostess really went out of her way - as she served, two people were no-added salt, i was vegan, two were low-carb (keto? ), and three were "normal"! so i really did not even have a "not my food" issue to address. and weight is still good today. i valued sleep, and when the alarm went off at midnight i reset. feels much better. You will get there! Pretty flowers! We always use our phones for our photos, since they are always with us. Never take our other camera-too much of a hassle to carry it when out walking. Please take a pic of the whales, if you get a good shot of them! I was wondering if you see them. Would love to one day see them!!!! What a beautiful picture! I'm so glad you and your dh are able to enjoy running together. I think that is wonderful! The run course sounds like the perfect set up to get you back in the groove. Your body will catch up and you'll do more. I'm envying your weather and being able to run outdoors. It's too cold and icy for me right now. Being close to sea on your run, are you in dry sand any? Loose dry sand has always been a challenge, even when I was young, under 200 lbs and fit! Your running loop sounds perfect. I am glad you mentioned being happy with where you are in your fitness level. We all need that reminder to be happy, but keep moving forward. Glad to hear you're running again. I suspect that running anywhere in Molokai is a wonderful path! Yeah! You are back to running! Starting out slow will keep you running so smart choice! Beautiful photo. Glad you had your phone with you. Sounds like a delightful running loop. Congratulations on the running and maintenance success. Woo hoo! On getting back to running! I've been doing that too, and it feels great! 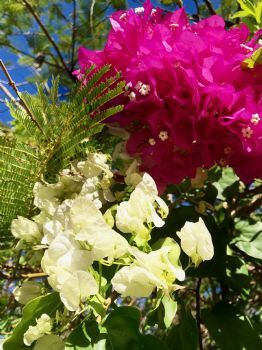 What an exuberant blog -- must be those brilliant bougainvilleas!! Running AND weight success: yay you!!! Sounds like a lovely running path! What a wonderful hostess to accomodate all those nutrition styles! AND you didn't have the "not my food issue" to contend with. Beautiful photo! I like your run/walk plan. Your DH speaks the truth. Having a camera at all, even on the phone is better than the best camera that isn't there!